I trained at the Univeristy of Miami Miller School of Medicine, completing residencies in pediatrics, dermatology and fellowship in pediatric dermatology there. I am a ABMS board certified dermatologist and pediatric dermatologist. 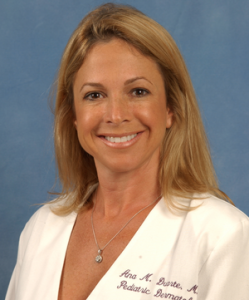 I have held the position of Division Director of Dermatology at Miami Children’s Hospital since 1995. In 1995, I also the founded the Children’s Skin Center, PA. The Children’s Skin Center, PA is a medical practice primarily dedicated to the care of infants, children, adolescents and young adults affected by full spectrum of dermatological conditions both common and complex. I am especially interested and have expertise in the the medical management and laser surgery of hemangiomas of infancy and portwine stains and have successfully treated thousands of patients with these birthmarks over the last 14 years.